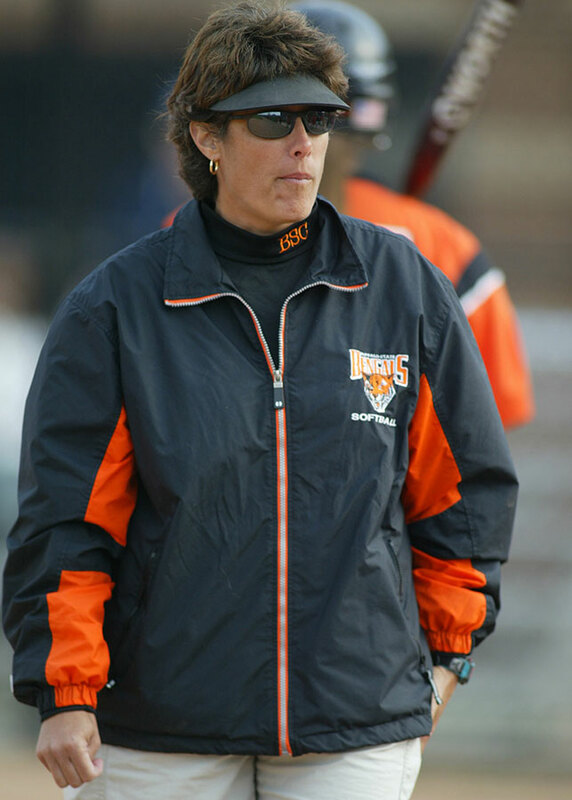 Sandy Hollander established a national reputation as Buffalo State’s softball coach from 1989 until her passing in 2012. The Bengals enjoyed great success during Hollander’s tenure. She ranks in the Top-35 among all-time NCAA Division III softball coaches in victories with an overall record of 562-342-2 (a .621 winning percentage), while claiming three SUNYAC titles and making eight trips to the NCAA Division III playoffs. Hollander was hired at the college as an assistant athletic trainer in 1985 and was later promoted to head athletic trainer, a position she held until 2007. In so doing, she was believed to be the first female athletic trainer in the nation for a college football team. Sandy was promoted to Assistant Director of Athletics and Senior Woman Administrator in 2009. Hollander also spent time as the athletic department’s equipment manager, assistant softball and assistant soccer coach. In January 2006, Hollander was diagnosed with colorectal cancer and underwent an extensive treatment program. In that season, Hollander was in the Bengals’ dugout for all 42 games and led the team to a 30-12 record and a third-place showing at the SUNYAC Championships. In January 2007, Hollander discovered that the cancer had spread to her lungs. Undergoing treatment, again, Hollander did not miss a single game, leading her Bengals to a 27-11 mark and their sixth-consecutive SUNYAC playoff appearance, where they placed third. In 2008, Hollander was unable to travel to Florida with her team, as she recovered from surgery, but returned to the dugout when the Bengals opened regular season play. She was her same fiery self, leading her team to a 28-15 record and an appearance in the SUNYAC Championship game. She continued to fight cancer for the next four years, but remained committed to mentoring the young women on the softball team. In 2009, she led the Bengals to a school record 34 wins and the program’s fourth SUNYAC Championship. Buffalo State advanced to the championship game in the NCAA regional, falling one win shy of advancing to its first College World Series. Hollander again led the Bengals to an appearance in the 2011 SUNYAC title game. In all, she collected 17 20-win seasons, and four 30-win campaigns. She received SUNYAC Coach of the Year honors four times (1990, 1996, 2008 and 2009) and guided her team to the first of three SUNYAC Championships in 1996. The Bengals claimed their second conference title under Hollander in 2000 and added the third in 2009. In 2009, she was selected the ECAC Upstate Coach of the Year. In 1992 and 1993, she led the program to consecutive New York State championships and was chosen New York State and Regional Coach of the Year by the Softball Coaches Association. In 1991, Hollander’s Bengals ranked as high as ninth in the nation. Hollander, a 1981 graduate of Indiana University, mentored six All-Americans, more than 50 All-Region performers, and 83 players who gained All-SUNYAC recognition. Among more than 50 players gaining All-ECAC status were three players who were also named ECAC Player of the Year. Hollander was inducted into the Western New York Softball Hall of Fame in 2005. She was also enshrined in the Kenmore West Senior High School Hall of Fame in 2011 and was a 2008 recipient of the SUNYAC Award of Valor.